"What we have to offer, both in hydro and in windpower, can be part of [a green energy] solution," Premier Dwight Ball told his eastern Canadian counterparts and the governors of the New England states at their annual international meeting. CBC reported Ball's comments, which is where that quote came from. Except for one teensy problem. Ball's comment is a gigantic pile of crap. And the governors know it. Yes it is a slow time of the year for news. 1. What precisely did Kathy Dunderdale say that was worth three days of CBC television, radio, and online coverage plus a Pam Frampton column? Did she say even one thing that was new? 2. Is it news that yet another premier from Newfoundland and Labrador has gone off to yet another conference flogging the Lower Churchill... with nothing to show for it but a news release? 2011: KD and the governors' "keen interest"
2015: Paul Davis and the national meeting of American governors. And that isn't the result of a serious search. 3. Will it be news that those premiers didn't sell one electron from the damn dam because even totally subsidised by all those people on low and fixed incomes in Newfoundland and Labrador, Muskrat Falls is still too friggin' expensive? So far it hasn't been - not even in 2009 - which would actually make that a genuinely new story. 4. Critch does a Dwight impersonation and Dwight appears on stage. We are thisfaraway from a string of guest appearances on 22 minutes that drags on like an hour. These days, Chris Mitchelmore does what Steve Kent used to do: hype tourism numbers. Yeah, well, take a breath. The provincial government has been going through a spell of something called zero-based budgeting as part of its ongoing efforts to cope with the massive government financial problem. ZBB, as it is known, examines the budget in detail, justifying each expenditure, not just the changes from year to year that would be considered in the usual way of budgeting. You started from a base of zero, as the name implies. If the government makes any changes in the budget this fall, they will be out of this ZBB approach. When he chucked a few deputy ministers overboard a week or so ago, Premier Dwight Ball said that these extremely small changes in the organisation of his administration came out of the realisation they had enough deputy ministers to run the Ontario government. Quick aside: This is a common Ball-splanation for his actions. "We" have learned something. They ditched Cathy Dornan as a communications advisor because "we" had learned enough so "we" didn't need her services any more. "We can do it all in-house. Changes in government organization: "after seven or eight months in office, "we" know more now than we "we" did earlier. Just flag that whole idea in your mind. There's an SRBP post coming on it just because it is a rather curious - but revealing - way of looking at the world. For our purposes, though, let's just notice that what it obviously means is that Ball and his folks don't have anybody thinking about the basics of government organization. They have a former ACOA boss running Government Renewal Initiative - called GRIM in-house - but whatever he is doing, it seems to be largely an out-placement service for recently retired ACOA senior executives. So if nobody else is doing any big picture thinking about government, we should give it a try. 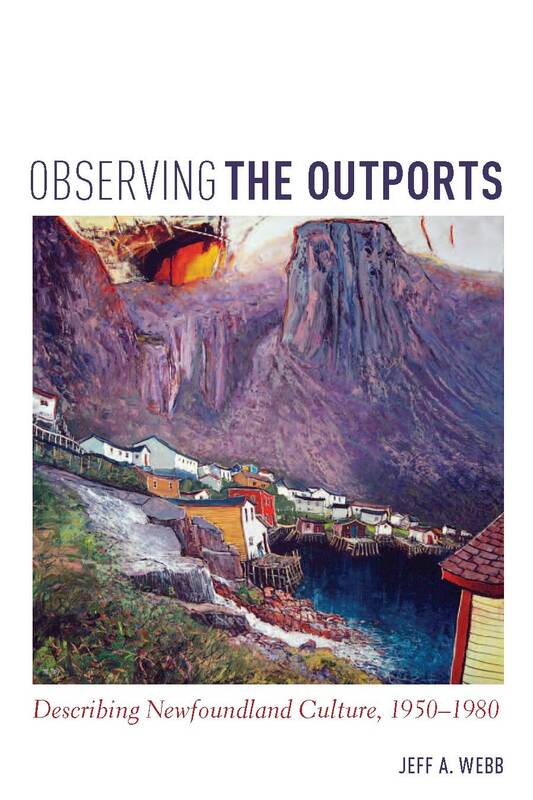 "The years after Newfoundland’s confederation with Canada were ones of rapid social and economic change, as provincial resettlement and industrialization initiatives attempted to transform the lives of rural Newfoundlanders. 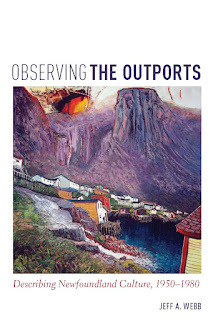 "In Observing the Outports, historian Jeff A. Webb illustrates how interdisciplinary collaborations among scholars of lexicography, history, folklore, anthropology, sociology, and geography laid the foundation of our understanding of Newfoundland society in an era of modernization. His extensive archival research and oral history interviews illuminate how scholars at Memorial University created an intellectual movement that paralleled the province’s cultural revival." Somewhere in Newfoundland and Labrador, someone may not have heard the news. There is oil and natural gas in the ground under water off our coast. Never mind that this has been widely reported since the 1960s when someone first started exploring seriously out there. Never mind, either, that we have had oil fields producing oil and filling the provincial government's bank account with billions of dollars since the late 1990s. Some people might have missed that we have oil and has. And we have a lot more than anyone is currently producing. It is out of concern for these couple of folks living in a cave possibly in the Annieopsquotch Mountains that the provincial government has held a news conference to announce the latest estimates of how much more oil might, possibly, theoretically be out there. Well, either that or it is polling month and the politicians are in deep political trouble this year, like their predecessors were last October when they held a news conference to announce last year's estimates of theoretical future gloriosity lurking somewhere underground. Maybe. Regular readers shouldn't be surprised to discover the Liberals put a giant loophole in their independent appointments commission law that said, in essence, that they didn't have to use the commission if they didn't want to do so. Danny Williams did exactly the same thing in 2004. In fact, the very first words in the fixed-election section of the House of Assembly Act say that nothing prevents the Lieutenant Governor from calling an election or proroguing the House of Assembly whenever he or she wants. So election dates are fixed except when they are not fixed, which is all the time. The provincial New Democrats claim the Liberals broke their own independent appointments commission law when they appointed a bunch of folks to senior executive positions in the provincial public service last week. Right off the bat, let's be clear: the appointments didn't break the new Liberal signature law. That's because the law has a gigantic loophole built into it. Section 4 of the Independent Appointments Commission Act says that the lieutenant governor-in- council or the minister making an appointment "shall consider the recommendations of the commission in making an appointment." The definition of an appointment is one made under another Act or to a position listed in the schedule at the end of the IAC Act. Pretty clear. This is the purpose of the new Act, right there. Appointments get made based on recommendations of the new commission. And having read that, the Dipper geniuses wrote their news release. But this is like the headpiece of the Staff of Ra and the Dippers only had one side of the headpiece. The very next section of the IAC Act is the loophole. It's the bit where they take back everything the law said they had to do. Memorial University professor Alex Marland has a new book on the market. Brand Command is about political communications. Marland interviewed a lot of people and did a lot of research for this very big book that lots of people should read. One of the big ideas in the book is that politicians these days are very keen on something called message control. They have a fetish for consistency so that everyone is singing the same things from the same hymn book, as the metaphor goes. It's an old idea and there are many reasons why politicians like to be consistent. For one thing, repetition across many means of communication increases the likelihood the message gets through. On another level, though, consistent messaging means ultimately that actions match words. The message of the words must match the message in the action that makes those words real. In that sense, message consistency is about credibility and values and trust. Politicians like to tell people what they believe in and how they will make decisions. Voters don't spend a lot of time thinking about government so they want someone they can trust to make decisions they agree with or can generally trust are the right ones. When political analysts talk about "connecting with voters" that's what they are getting at. The real connection voters need to see is the one between the words used to make promises with the actions that follows. That connection makes the words credible 0 literally, believable - the next time there are words about what the politician will do. Anything that attacks a politician's credibility is bad and when - as in Ball's case - the wounds are all self-inflicted, then you know there is a huge problem. So why did Dwight Ball fire John Ottenheimer? Some people are very agitated at the prospect that the next justice of the Supreme Court of Canada might not "represent" Atlantic Canada like Justice Thomas Cromwell does. How exactly does one represent a region on a court or anywhere else for that matter? Do you have to come from there, for argument sake? Born there? Well, Justice Cromwell is from Ontario. Mary Ellen Turpel-Lafond is touted by some as a sure bet to get the appointment. From Saskatchewan. Taught law at Dalhousie, University of Toronto, Notre Dame and a few other places her bio doesn't mention. Does that sort of thing count in her favour, seeing as she has experience living and working across the country? The next person appointed to the Supreme Court of Canada should get the job based on merit that is related to the law and justice. Everything else - including facility with French - should be secondary. B'y, it is really hard to call the changes announced on Wednesday as a "shake-up" of the public service or any kind of major change to anything really. Aside from chucking a very small number of people out the door, this change to the structure of government didn't do much of anything but leave you wondering what the point was. There have been rumblings of these changes going back months. Folks looking for some sort of massive shake-up in the fall might be disappointed to discover this was it. Most likely the next big news we will get is in the budget next spring. But let's run through Wednesday's head-shaker-upper-whatever. The Town of Placentia has a new cenotaph. Here's how the Southern Gazette writer described the new monument: "The Cenotaph is a tribute to those from all the current and former communities of Placentia Bay who served in the First World War, Second World War, Korean War and peacekeeping missions." And it is a tribute to all the people who served in war and in peacekeeping operations. The Oxford English Dictionary defines a cenotaph as "a monument to someone buried elsewhere, especially one commemorating people who died in a war." A cenotaph cannot honour veterans. The word comes from the Latin and Greek words for empty tomb. They survived a war or peacekeeping mission, by definition. While it is a really lovely idea to gather together a list of all the people from Placentia Bay who served in the military at some point, maybe there is a better way to recognise their service - not their death - than erecting a big slab of rock and calling it a cenotaph. 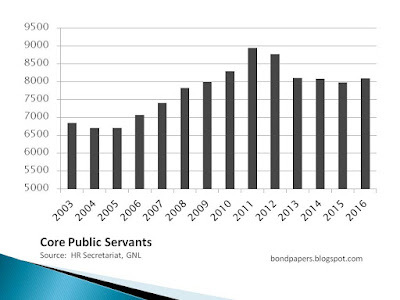 A couple of access to information requests - pdf 1 and pdf 2 - gave the world some new numbers on the growth in the core provincial public service from 2003 onward. Here are the grand totals in a nice chart. Each year is the total as of 31 December for that year. The 2016 number is the figure on July 4. The figures give changes in each department, excluding health care employees, the school boards and Crown agencies, boards, and corporations. We'll look at the departmental figures in another post. The Telegram's James McLeod apparently made the request wrote about someone else's access to information request, just as your humble e-scribbler is doing, but it looks like he drew some erroneous conclusions in tracking the growth of specific parts of the public service. The Big Picture numbers are useful, though. There were 6851 public servants at the end of 2003. That dropped to 6715 the following year and in 2006, the Conservatives started to hire. They peaked in 2011 with 8952 public servants. That's 33% larger from seven years earlier, in 2004. Since then the public service has declined by slightly less than 1,000 positions, which is about a 10% reduction. Sharp-eyed readers will note the differences in the figures supplied in a different access to information request in June. The differences are small but they illustrate the difficulties you can run into some times. The provincial government has been on its current course since about 2007. There were three elements to the Conservatives agenda under Danny Williams. They changed somewhat over time but these are the elements that dominated from 2003 to 2015. Above all else, Williams’ goal was to build the Lower Churchill. That was to be his one, lasting accomplishment. Williams would build what no one else had been able to build. While it was rationalised as a provincial project with lasting significance, the way it finally rolled out confirmed the extent to which the Lower Churchill was intensely personal. To build the Lower Churchill, Williams would turn Newfoundland and Labrador Hydro into an energy corporation to rival Hydro-Quebec. And to help fund it, Williams would acquire so-called equity stakes in offshore projects. When the Church Lady shows up, you know your comment on the Internet has hit the mark. The term comes from the self-righteous character made famous by Dana Carvey on Saturday Night Live and if there was a male equivalent, your humble e-scribbler would happily use it. Church Lady comments are the ones where the person avoids the sharply-pointed substance of what you said in favour of scolding you for the way you said it. Your humble e-scribbler scored two Church Lady responses on Twitter this week from two different on two different topics. The one to start this post was about an opinion column by CBC's Peter Cowan about the federal government's decision to change the way it will solicit nominees for a vacancy on the Supreme Court. There are three things about Cowan's column worth noting. Churchill Falls occupies a unique place in Newfoundland and Labrador's political culture. Most of what people believe about Churchill Falls is just sheer nonsense. Made up. Never true. Completely ludicrous. But accepted as fact and unshakeable truth all the same. And that's where things get weird. People use all that foolishness nonsense to make decisions in the real world. 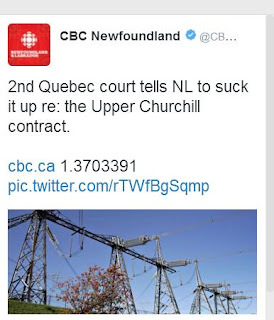 One of the enduring legends is that Newfoundland wanted a corridor to wheel electricity through Quebec, went to the federal government in the 1960s to look for one, couldn't get it, and thus wound up a slave to Hydro-Quebec in 1969. It's been a popular story since the 1970s, after the Newfoundland government nationalised BRINCO. There's never been any evidence that Joe Smallwood ever put the question to Lester Pearson although lots of people will swear to it and swear by the story as evidence of how Newfoundland has been shagged by whatever version of the foreign boogey-man they favour. Danny Williams trotted the story out, indirectly, in November 2010 when he announced he had committed the provincial government to build Muskrat Falls. Our electricity would never be stranded again. We would never again be held hostage by Quebec. The new, magnificent power corridor through Nova Scotia was the way that we would break Quebec's stranglehold over our magnificent future. Yay! Hooray! people screamed, including more than a few editors and columnists. The only thing was that what Williams said wasn't true. Forget everything else that you know about Muskrat Falls. The entire project hinged on Nalcor's ability to control water flows on the Churchill River. Nalcor's internal assessments showed that without the ability to control water flows, Nalcor's Lower Churchill project would reliably produce only about 17% of its nameplate capacity. That means that Muskrat Falls would have a firm generating capacity of about 140 megawatts, which is less than the free block of power Nalcor guaranteed Emera and Nova Scotia. Nalcor gambled on a dubious interpretation of the 1969 power contract and lost. The impact on Muskrat Falls will be devastating. Ocean Choice International is in better financial shape today, having successfully dumped a surplus shrimp processing facility on the people of Port Union. The plant - seriously damaged in 2010 during Hurricane Igor still needs major renovations. OCI put the plant on the market in 2012 but couldn't find buyers. In 2012, company president Blaine Sullivan said that even if the hurricane hadn't damaged the plant, OCI would have closed either Port Union or the company's other shrimp plant in Port aux Choix. The company couldn't supply both profitably with declines in the shrimp quota. A company with strong ties to the provincial and federal Conservatives, OCI picked up the Port Union plant and other assets after the former provincial Conservative administration hounded Fishery Products International into self-destruction. Then-fisheries minister Tom Rideout - right, precisely as illustrated, - played a key role in the campaign to destroy FPI. 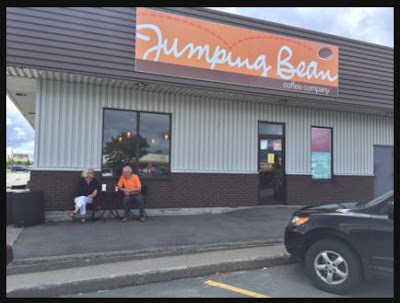 Neil King, the Liberal MHA for the district, posted on Facebook that he would "be working with the town to secure funding for renovations which will create jobs in the short term." That money would come from taxpayers, of course, although King did say if he'd be looking to St. John's or Ottawa to help out. During the filibuster in the last session of the House of Assembly, education minister Dale Kirby reminded everyone of why the current administration is following its financial policy. Didn't want to create a second moratorium, Kirby said. or words to that effect. Significant cuts to government spending of the kind needed to cope with the government's financial problem would cause a second moratorium. Kirby's point was that the current crowd were not gonna do that. It's August and Corporate Research Associates is in the field. On Tuesday, Ed Joyce told the people of Holyrood, Isles aux Morts, and Jackson's Arm that they would each be getting new fire trucks. No, Ed didn't deliver a new fire truck to each community. He held a news conference to announce that the three communities fire trucks were on order. Why would anyone hold a big announcement to say that government had put money aside for a new fire truck for three towns? Go back and read that first sentence again. Yes folks. The Liberals - tanking in the polls - are going to try and goose that CRA poll with some happy news. Parents in Whitbourne took the provincial government's English School District to court over the closure of the local school. It's proof that a few determined people can use the tools at their disposal to fight for what they believe in. They don't need some government-paid consultant, no matter what someone angling for a government job might suggest. People need only have the courage of their convictions. That's all you need. That's how democracy works. "They say that I could stand in the middle of 5th Avenue and shoot somebody and I wouldn't lose voters." And what I mean by "he can get away with doing it" is that the premier's popularity is such that he could strangle a baby in the middle of the Avalon Mall parking lot with the assembled provincial media in attendance and there would be people that would say the baby had it coming. If the provincial New Democrats had sent a garden gnome around the province, odds are that the photos he'd have brought back would be more interesting than the stuff Earle McCurdy is posting from his wanderings around the province this summer. This is a picture Earle tweeted on Monday from a coffee shop in Gander. Admittedly, it has been a few years since your humble e-scribbler has visited Suburbia-in-the-Woods, but recent news reports suggest that there is a sizeable population of folks still there. Well, enough at least that a fellow of the political stature of Chainsaw Earle might possibly manage to draw enough of an audience on his own account as to populate a decent size photo. And certainly enough if the local squad of New Democratic Party zealots got all together in one spot, they might be able to pass themselves off as something resembling a handful, if not a bunch. In the face of thousands of well-informed people telling Dwight Ball that the provincial government must change direction to survive, in the face of mountains of evidence that the province has been on the wrong course since 2005 or so, and lately, in the face of dire warnings from the folks who advise others about the value of the government's bonds, Dwight Ball will continue to do what everyone knows doesn't work. The provincial government is abandoning its economic plans, as the Telegram's James McLeod would have it last Friday.